In today’s competitive job market, it is important to find and use every opportunity to make a lasting impression in an interview. Learning how to prepare for what you should do before, during, and after an interview can help you stand out in a crowd of similar candidates when competing for the same position. First and foremost, it’s crucial to take the time to research more about the job position, the interviewer, and about the company you are interviewing for. Investigate the company’s website, social media channels, and their profile on Glassdoor to get the inside scoop on a company. To help you stand out in the interview, learn the company’s values and highlight any personal values or experiences that align with their values. Reputable companies want employees who align themselves with their core values and company culture. So be sure to make a point to let them know if yours align, as this is a strong indicator of a good fit. To go a step further, find your interviewer on LinkedIn and see what you both have in common so you can spark a meaningful conversation during your interview. Lastly, and perhaps most obvious, make sure you thoroughly read the job description for the position you are applying for to understand what the role entails. If they do not inform you of the dress code beforehand, utilize your research of the company culture to make an educated guess on the company’s dress code and pick an outfit that is slightly dressier. For example, if the company’s dress code is casual, wear a business casual outfit. Likewise, if the company’s dress code is business casual, wear a suit. Pick out your outfit early enough to get rid of any unwanted wrinkles or stains. Don’t forget that it is most important to be and feel comfortable with whatever you decide to wear. Confirm an interview time and address in advance. Map out the route to see how long the drive is and take into account any unplanned traffic. On interview day, the last thing you want to do is search for an email from several weeks back with the address to your interview. Wake up with enough time to eat breakfast, comb your hair, get comfortable in your outfit, and gather your belongings. Leave early enough to arrive at the destination with at least 10 minutes to spare. Use this time to find parking, rehearse a few lines, and compose yourself. As attached as you might be to your phone, it is a wise decision to leave it in the car. The reason for this is to avoid any room for disruptions that can make you look unprofessional. Disruptions can include, but not be limited to, buzzing vibrations or awkward ringtones. These disruptions can lead you to lose your train of thought and lose the connection you may have been making with the interviewer. Only bring a cellphone to your interview if you are expecting an emergency call. And, if this is the case, be sure to give your interviewer a fair warning. Shaking hands may seem like a basic gesture when meeting someone, but it is often forgotten that it greatly affects the first and last impression you make. Your handshake with the interviewer should be firm and last no more than two to three seconds. Throw in a smile and greeting with your handshake to add to the gesture. A good handshake can contribute to your professionalism, but don’t overthink it. Just be prepared and practice a couple of times if need be! Your handshake is only one of the many gestures you make during an interview. 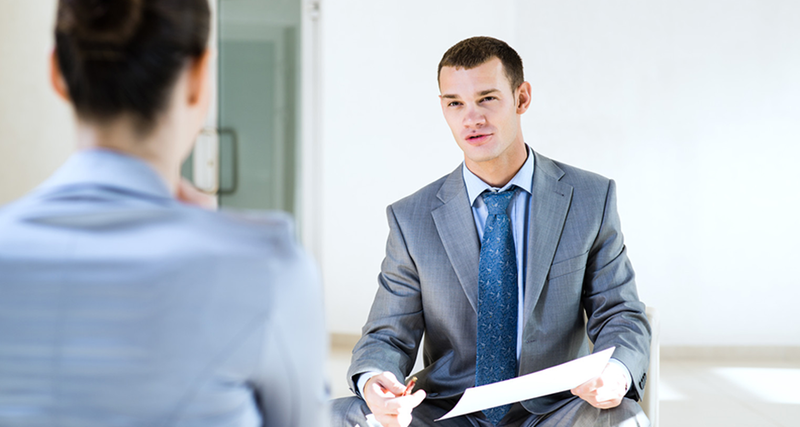 It is important to remain aware of your body language throughout the interview. Good body posture, like a straight back and open chest, helps you appear more confident whereas bad posture, like crossed arms and hunched shoulders, can make you appear disengaged. Learn to control your posture and use your body language to your advantage. Smiling and maintaining eye contact go a long way when leaving a lasting impression. It might help to practice answering interview questions with a friend or family member so they can let you know how your body language is perceived and if you have any nervous ticks. During the interview, you will be striking good conversation with the interview and will want to take notes. When the interviewer answers your questions in detail or expands on a point you may have made, continue to look alert and write it down. This doesn’t mean you should write down every word they say or get lost in taking extensive notes. It is important to keep eye contact with the interviewer and stay engaged with the conversation. These notes will be useful later (Tip #10). When your interview was scheduled, you should have gotten a list of what to bring. In the case that you didn’t, you should bring extra copies of your CV/resume, samples of your work, a list of references, a pen, paper, and an ID. It is recommended that you have a padfolio, or at least a folder, to store these items in a professional manner. Even when you are told you don’t need to bring anything, it gives you a safer feeling to have all these things on hand. Of course, the added bonus is that it’ll make you look more credible and prepared. Further prove your interest in the job by asking meaningful questions and striking conversation beyond standard interview questions. Feel free to ask questions directed at the interview whether it’s about their position or why they enjoy working at the company. Additionally, ask questions that will help you gain more knowledge about the position you are interviewing for. This will help you fully understand the responsibilities of the position and gives you another opportunity to highlight any relating skills. Don’t think that thanking your interviewer at the end of the interview marks the end of this process. Send an email, within 24 hours, thanking the interviewer for their time spent interviewing you for the job. Using your notes (Tip #7), mention something you learned about the company that you found to be important. Sending this email is courteous and conveys your interest in the position. However, be warned that a Thank You email full of grammatical and spelling errors is worse than not sending one at all, so be sure to proofread thoroughly before you click send. Eastridge Workforce Solutions’ purpose is to provide opportunity and enrichment through work. Contact us today to find your next career opportunity or search our job board for current job openings.